Senate President Kevin Raye, R-Perry, listens to debate on the budget in the Senate at the State House in Augusta, Maine, on Thursday, June 16, 2011. PERRY, Maine — A political rumor that has persisted for several months appears to be true. Senate President Kevin Raye, R-Perry, announced Tuesday the formation of an exploratory committee to consider challenging Democrat Mike Michaud for Maine’s 2nd Congressional District seat in 2012. Senate Assistant Majority Leader Debra Plowman, R-Hampden, and former House Minority Leader Josh Tardy of Newport will co-chair Raye’s exploratory committee. 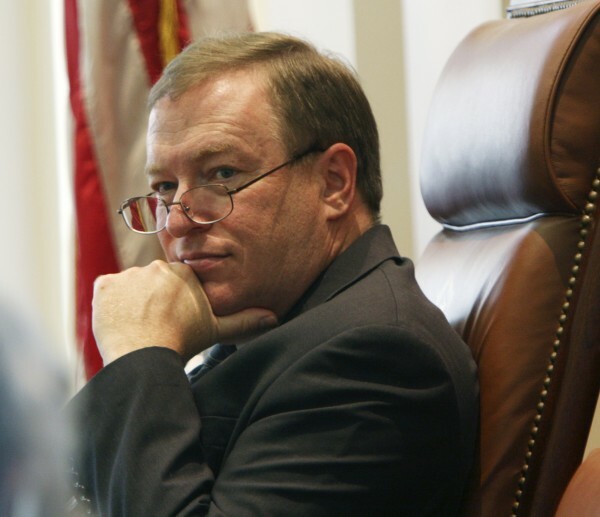 Mark Brewer, a political scientist at the University of Maine, agreed with Tardy that Raye is the GOP’s strongest candidate and Michaud’s biggest challenge to date. Raye and his wife, Karen, live in Perry and own and operate Raye’s Mustard Mill in Eastport, a fourth-generation family business. He is serving his fourth — and final, due to term limits — term in the Maine Senate. Before that, he was an aide to U.S. Sen. Olympia Snowe for 17 years, including six as her chief of staff. If Raye is on the ballot in 2012 against Michaud, it will be a rematch from 10 years ago. In 2002, Raye won a four-way GOP primary for the 2nd District nomination and ran against Michaud, then seeking his first term in Congress. Michaud won with 52 percent of the vote, which is the closest race he has been in as a U.S. Representative. Gregory Olsen, Michaud’s campaign manager, said right now the congressman is focused on doing the job he was elected to do in 2010. “Come next fall, we will run a vigorous campaign on his record of success in helping our veterans, investing in our infrastructure and promoting a trade policy that favors American jobs and manufacturers,” he said. Maine Democratic Party Chairman Ben Grant said Raye has shown during his eight years in the Maine Legislature that his priorities don’t match those who live in the 2nd District. “He championed a health insurance bill that’s causing sky rocketing insurance rates for small businesses in rural Maine, voted against raising the minimum wage, and supported cuts to infrastructure funding,” Grant said. Although he called Raye Michaud’s toughest competitor, Brewer said Michaud remains the perfect fit in Maine’s 2nd District because of his working-class roots there and his moderate views. But Brewer also said national political conditions could play into the race. Right now, Michaud is running alongside an unpopular president in Barack Obama, and as unpopular as the president is nationally, he’s even more so in Maine, as evidenced by recent polling data. “The Republicans have to view that seat as a pick up,” Brewer said. Raye’s name has been out there as a potential challenger to Michaud for several months. In August and September, while Maine Democrats and Republicans were working to redraw Maine’s two congressional districts, Raye’s name came up often. In fact, the GOP’s original redistricting plan, dubbed the “Western Maine Plan” by Republicans, became known as the “Kevin Raye Plan” by Democrats because it would have moved approximately 8,700 Republicans from the 1st to the 2nd District. That would have made an already competitive district even more so. The redistricting plan that eventually was approved by the Legislature was a less drastic redrawing of the line, but still moved as many as 2,000 registered Republicans into the 2nd District. Brewer said the Maine GOP was right to abandon the western Maine plan, especially now that Raye appears to be their candidate. “If they shoved it through that plan and everyone was calling it the ‘Kevin Raye plan,’ it would be hanging on his neck,” Brewer said.